With the quality of camera sensors vastly improving in recent years, allowing shooting in low light levels, there poses a question of whether artificial lighting is needed to create film or TV now. I have conducted research into this subject, and have included my findings below. For the full paper, please contact me. In 1891, Thomas Edison invented the first known motion-picture camera. Known as the ‘Kinetograph’, the camera used 35mm emulsion-coated celluloid film to capture its images (History of Edison Motion Pictures: Origins of Motion Pictures–the Kinetoscope, memory.loc.gov, website). Since then, research and development into camera technology has made huge advances. In the early thirties Television in the UK was just starting. When television broadcasting first took off, the cameras that were developed used an Iconoscope tube (European and America Television Cameras, www.tvcameramuseum.org, website) to translate the light entering the camera into an electronic signal ready for broadcast. Iconoscopes had a relatively low response to light; so on location use in the UK, where studio lights are not used, only a small signal output would be measured. To get around this problem, studio facilities were used so that the light intensity could be controlled. By increasing the amount of light on the subject, the Iconoscope tube would give a greater signal level. This meant that the signal to noise ratio was improved, giving the viewer a better quality image. If only a small amount of light was used, the signal output had to be amplified thus amplifying the impurities of the noise as well as the required signal; the resulting image quality was impaired. During the 1970’s, as technology developed at a growing pace, the Charged Coupled Device was starting to be used as the image sensor device in broadcast cameras (CCD History, www.about.com, website). The CCD had far better light sensitivity than its predecessors; this meant that the cameras could function better in lower levels of light. This revolutionised TV production, meaning that live outside broadcast segments were much easier to achieve with artificial lighting no longer totally necessary. The Charged Couple Device has served camera technology well but, in 2008, according to Broadcast Engineering website (Ebben, 2008, www.broadcastengineering.com, website) the time of the CCD chip was nearly at its end. A further advancement in technology, the CMOS (complementary metal-oxide semiconductor) chip, was taking the place of the CCD. Indication of how far technology has come can be seen in the ARRI ALEXA camera. The ARRI ALEXA camera is a modern state of the art camera used to record both films for the cinema and dramas for TV. The ARRI ALEXA makes use of 35 format ALEV III CMOS, the next advancement in camera sensor technology (ALEXA Specifications, www.arri.com, website) sensors to produce their high quality image. This specially designed ALEV III CMOS sensor allows for an astonishing illusion of light in relatively unlit scenes. One of the major manufactures of lighting fixtures for both Film and TV production was Strand Electric. A historic archive of their products is featured on ‘The Strand Archive’ (The Strand Archive, http://www.strandarchive.co.uk/, website). Jon Primrose, from the University of Exeter drama department, compiles this website. Using arc lamps in an enclosed studio was very dangerous as they emitted UV-A, UV-B and UV-C rays. This meant that they had to be used in well-ventilated facilities. There are many other disadvantages of arc lighting, which would mean they would not be suitable to use in TV or film production today. A major problem was that the light output flickered as the carbon burned, meaning that if you were to use the lamp as a key light, then the presenter’s face may flicker in and out of darkness. 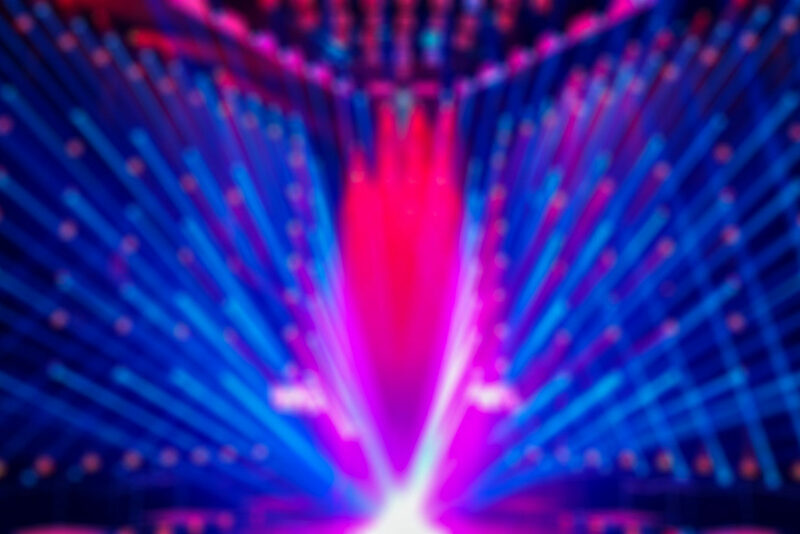 Another problem that would arise in today’s modern world would be the radio interference that arc lamps produce, meaning that disputes between the lighting and sound departments would arise. As research into lighting progressed, the introduction of incandescent bulbs emerged into the market. Incandescent lamps eliminated the majority of the disadvantages that arc lamps caused. To start with the light output of these lamps was not as efficient as its predecessor, however the pros far outweighed the cons. With the development of the Ductile Tungsten filament being commercialised in 1908, manufacturers could use this new technology to develop studio lamps. The introduction of these tungsten lamps slowly took over from the carbon arc as less intensity was needed for the camera exposure, and has been used in the TV and film industries for over 50 years and is still used in studios across the world today. However, incandescent sources, such as tungsten, are not very environmentally friendly with a low luminous efficiency, converting only 10% of the input energy into visible light, the remaining 90% is converted into wasted heat (Incandescent Lamps, http://www.edisontechcenter.org, website). Thinking ahead to the future of lighting, the obvious advancement from the current technology film and TV studios use, is LED technology. Companies are in the process of developing lamps (and have achieved) that replicate the colour temperature and dimming curves of a convential tungsten light. An example of this would be the ETC Source Four CE LED Tungsten, which has been designed to perfectly emulate tungsten light (Source Four CE LED Tungsten, website). This new LED technology may not be widely accepted in its current state, but when the technology is proven to be at an industry acceptable level, then this technology is due to change the way artificial lighting is used in the production of film and TV. With the introduction of LED technology, comes huge environmental benefits. For instance the LED Source 4 only draws a maximum of 155.7watts of power compared to its tungsten lamp predecessor that draws up to 750w. The tungsten incandescent source converts 1 watt into 14.9 lumens, whereas the LED equivalent can provide 29.2 lumens per watt (Source Four Fixed Focus Datasheet, website) (Source Four CE LED Tungsten Datasheet, website). Lighting directors such as Roger Williams say “hopefully, it’ll be 5 years before studios will start to stock LED generics, and I can’t wait until it happens, it’s ludicrous the amount of energy we waste” (R.Williams, 2013, interview). When TV was in its infancy, studio facilities were built so that cameras could film in a controlled lighting environment. For the original Iconoscope tube cameras, that had a low response to light, a lot of light would need to be cast on the subject and set for it to be seen in the way the director would want on the viewer’s screen. To the average viewer at home watching a TV show, if the lighting for the programme is done correctly, then it will often go unnoticed. However when lighting is done incorrectly, or there is a lack of lighting altogether then the audience would notice a lack of quality in the production. With incandescent sources being used for such a long period of time there is pressure from facility owners to reduce their carbon emissions. Consequently, there is currently a debate surrounding the use of incandescent fixtures in studios, coming largely from the owners of the studio complexes. The argument is about the efficiency of the units making them far too costly to run. From personal experience, all of the lighting designers spoken to for this study, still want to use tungsten sources, because they produce ‘excellent colour rendition’. The BBC research and development team have compiled a pack for studio managers and lighting designers to use that aids them in reducing the carbon footprint of the studios, specifically by the choice of light that they use. It is noted that there is no mention of what a studio production would look like if only the house lights were to be used. This obviously would reduce the studio’s carbon emissions but is accepted, by all professionals interviewed for this study, that there is an obvious need for artificial lighting in the production of TV. The need for lighting in light entertainment TV production has the same fundamental principles, but the way certain aspects are lit has changed dramatically. The main change is the way set objects are illuminated with the change from incandescent to LED lighting. Modern TV production sees the use of LED fixtures being used as integral parts of the set, as well as LEDs starting to be used instead of incandescent sources. Although the technology may be changing, the need for lighting has not altered. There has always been a need for the use of artificial lighting in the production of films made in a studio environment. Hollywood was originally a prime venue for filmmaking because of the abundance of sunshine available. Whereas traditionally lighting was a necessity for the correct exposures, today lighting is used much more creatively to help convey a specific mood or emotion to the audience. Filmmakers, Lars von Trier and Thomas Vinterburg could see that the process of filming was coming at a growing cost. They worked together in 1995 to create the Dogme 95 manifesto. The Dogme 95 manifesto set rules for a style of extreme filmmaking to use the least amount of equipment needed, but still create a film for cinema standards. An article in the American Cinematography Magazine, written by Patricia Thompson, speaks about the use of the Dogme 95 manifesto in the film The Idiots, directed by Lars von Trier. The film was shot on the Sony DSR VX-1000 Digital Handycam, which is said to have a good sharpness and high colour rendition and is also mentioned in the article that ‘The VX-1000 functions well in low-light (It’s maximum aperture is f1.6-2.1)’. One of the rules in the Dogme 95 manifesto stated that the use of artificial lighting was prohibited, only natural lighting from the sun or interior fitted lights are allowed. In earlier years of film production, this manifesto would have been impossible to abide by, due to the amount of light needed for correct exposure. At the time of the manifesto CCD chips were common in most handycams, which allowed for this style of filmmaking. The use of no artificial lights can cause a problem for filming if a scene is to be shot outdoors at night-time, where there is no aid of natural sunlight. The manifesto states that if there is insufficient lighting available then the scene must be cut or a just a single lamp attached to the camera can be fitted. Some Directors of Photography would be unhappy with Von Trier’s Dogme 95 manifesto. DOPs such as Vittorio Storaro exploit light to create the best effect for their piece. Storaro’s website quotes that cinematographers ‘write with Light and Motion, using Shade and Colour to punctuate one important part of the vocabulary of cinema.’ (Storaro, www.storarovittorio.com, website) He uses the positioning and flexibility of lighting to his advantage to create shadows and colours that you cannot do by using natural light. Whilst cameras may now be of a standard where they can achieve filming in poor lighting conditions, the outcome of not using artificial methods of lighting could result in the casting of shadows on a character or object. Natural sources of light, by default, come from where they are, not from a carefully placed position. The result may be that shadows are cast in the wrong places or silhouette effects that are far from desirable. This would certainly not be what the DOP requires for achieving the desired effect. In certain productions, such as some Lars von Trier films and outside broadcast News reports, you can do without lighting using modern cameras, but in the vast majority of cases lighting is still an essential tool to create the effect required by DOPs and TV lighting directors.